Posted by mareserinitatis in pets, work. 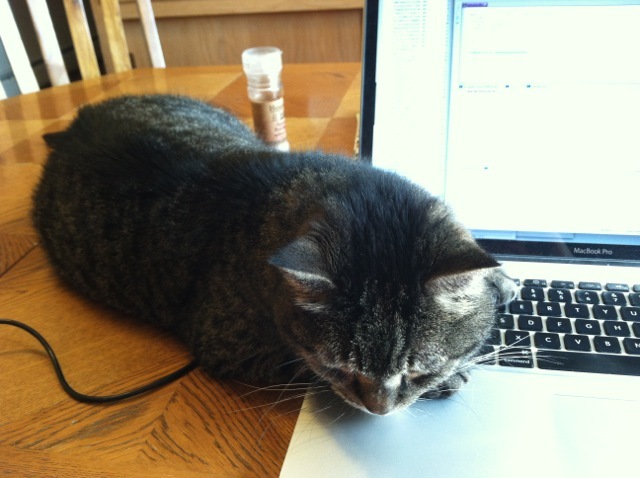 There is a definite disadvantage to working at home. In some cases, it comes in the form of a four-legged furry creature. One that wants you to pet it. While you’re typing. Today that creature was Macrocat. The following is a series of pictures I took while I was attempting to work. 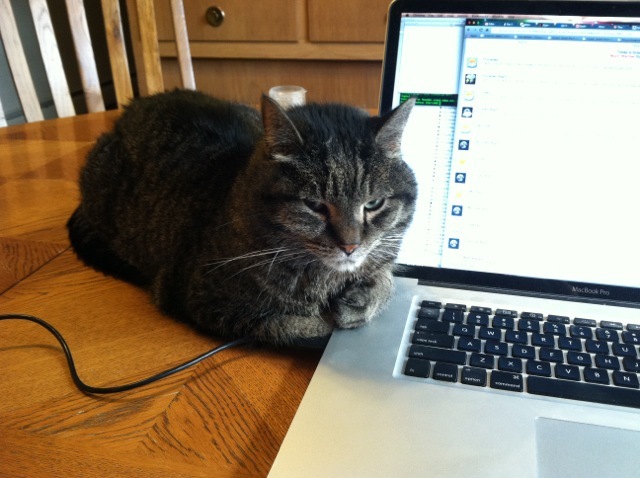 Apparently the keyboard looked like a great place to perch and keep an eye on me. 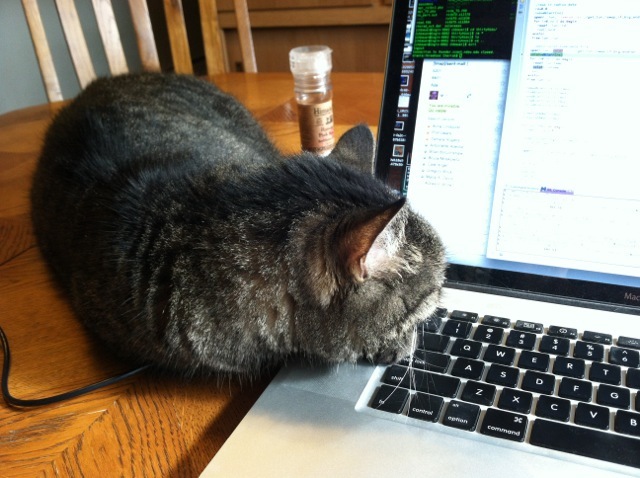 Pretty soon, though, he was trying to run things for me. But when I switched over to something else, he got bored. 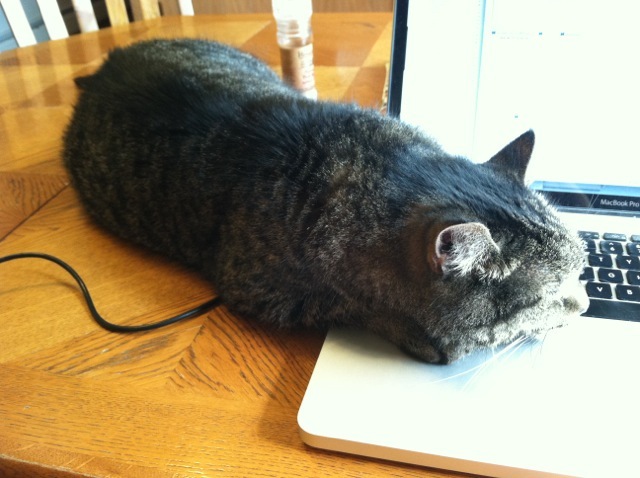 He started to ooze over the keyboard a bit. I tried to move him away, but he just turned his head. Then a paw creeped up beside the first one. And he moved his head over again. Actually, this is after I moved him off the table and he came back. And that wasn’t quite doing it for him, so he stretched out again. 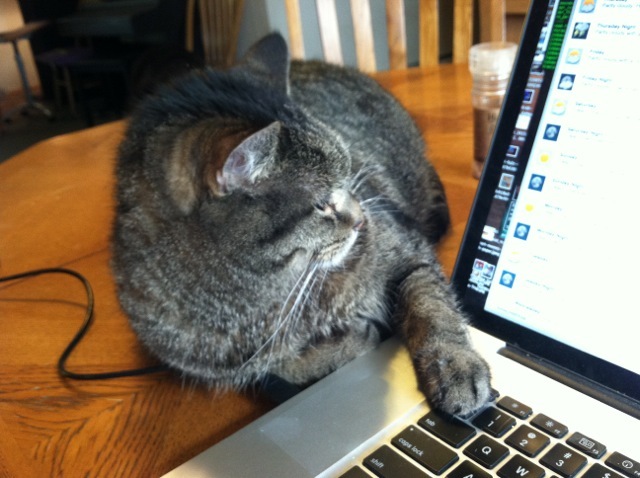 Finally, he put his paw on the trackpad and put pressure on a key. 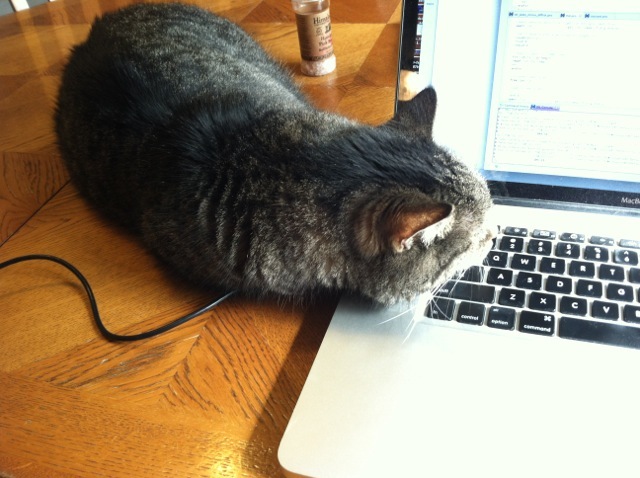 The computer started making a beeping sound to protest, but macrocat thought the computer was purring at him and merely laid down and purred more loudly in response. And that was the point where I finally had to banish him. 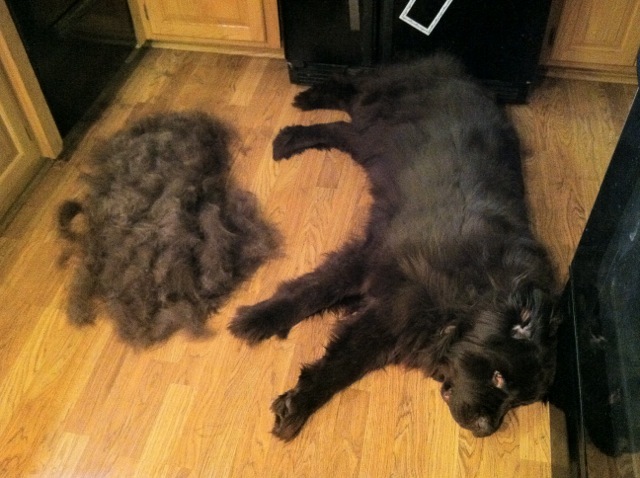 Newfoundland dogs have this funny habit of losing their undercoats a couple times a year, something people refer to as “blowing coat.” I suspect this is because fur ends up everywhere: it’s not unlike blowing insulation into your attic. Teradog doesn’t do it so much, but Gigadog definitely does. She seems to do this twice a year: once in summer and once in winter. (I don’t understand why she loses undercoat in January, but I suspect it’s because she’s inside an awful lot.) Anyway, to get an idea of what this looks like, I’ve included a picture. This is one of about a dozen groomings she’s had in the past 3-4 days. As you may be able to tell, she’s pretty relaxed. She seems to enjoy being brushed (I think this losing of the undercoat makes her itch). Teradog, on the other hand, hates being groomed. I suspect it’s because he wasn’t groomed much before we got him. He also has a much more cottony coat which is prone to clumping and tangling, and he’s had problems with skin infections in the past. Because we simply can’t get him to cooperate with regular grooming, he gets a shave in the beginning of every summer. I do keep trying to get him acclimatized to regular brushing, but we’ve not had much luck. It’s too bad, though, because I really enjoy brushing the pups. Either way, I think it looks funny because even though he’s about 40 pounds heavier than Gigadog, she looks bigger with a full coat. 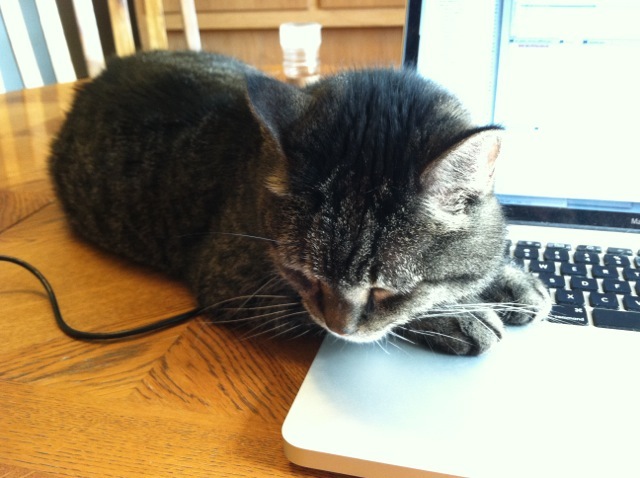 I know the premise behind wordless wednesday: just post a picture! If there’s any text, it should be in the title, right? I couldn’t do it today because this picture was so doggone (ha!) cute. I had a couple possible titles, so I will give both to you as well as give you the opportunity to provide your own. I was originally going to title it, “The Grumpy Old Men club.” Both Teradog and Macrocat are ‘old men’ and we frequently make jokes about Teradog’s barking being the equivalent of, “Get off my lawn, you kids!” And Macrocat is slowly becoming senile, though we love him very much. But looking at the picture again, I thought of a funnier title: “Macrocat teaches Teradog how to become Monorail Dog.” But maybe that’s only funny if you like cat memes. We had a couple dogs when I was growing up, but I was never really impressed with the idea of having one as a pet myself. 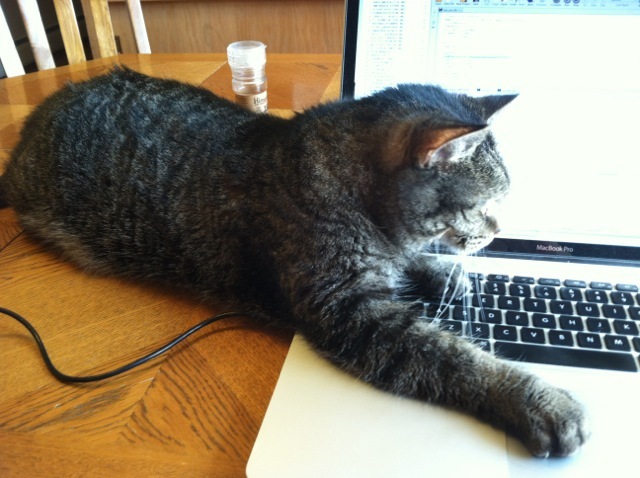 They always seemed like so much work compared to cats. 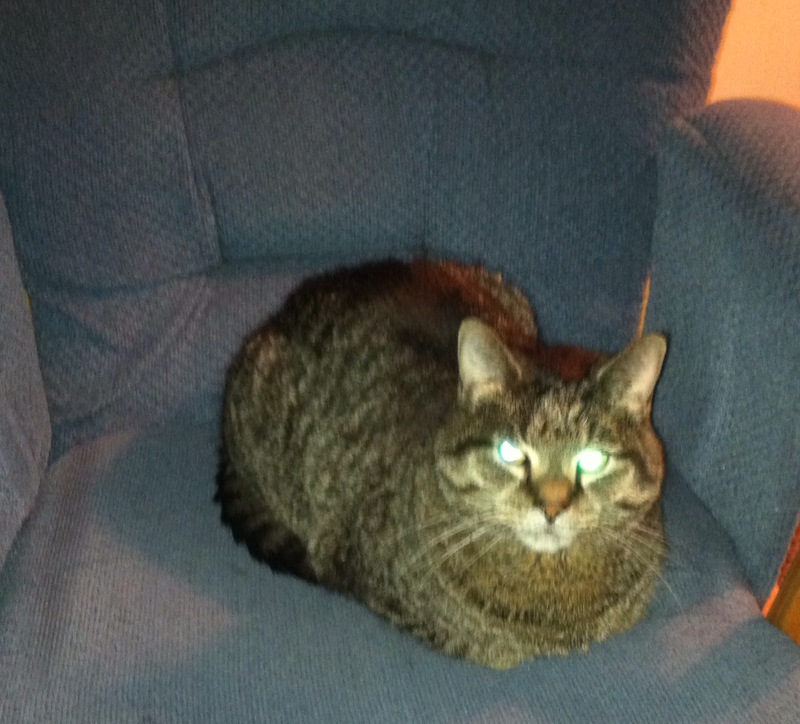 Of course, now that I’ve owned almost a dozen cats, I know that’s not necessarily true. I also realize now that you can train dogs, something which cats aren’t very willing or able to do, and that makes a huge difference when it comes to interacting with them. 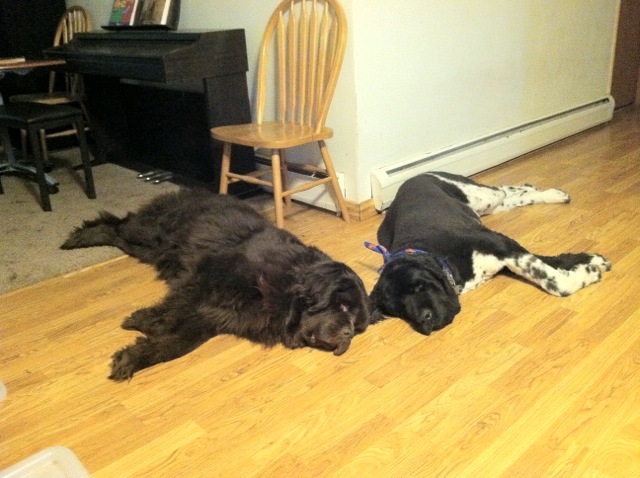 Still, a lot of people were surprised when I got a Newfoundland because not only is it a dog, but it’s a DOG. 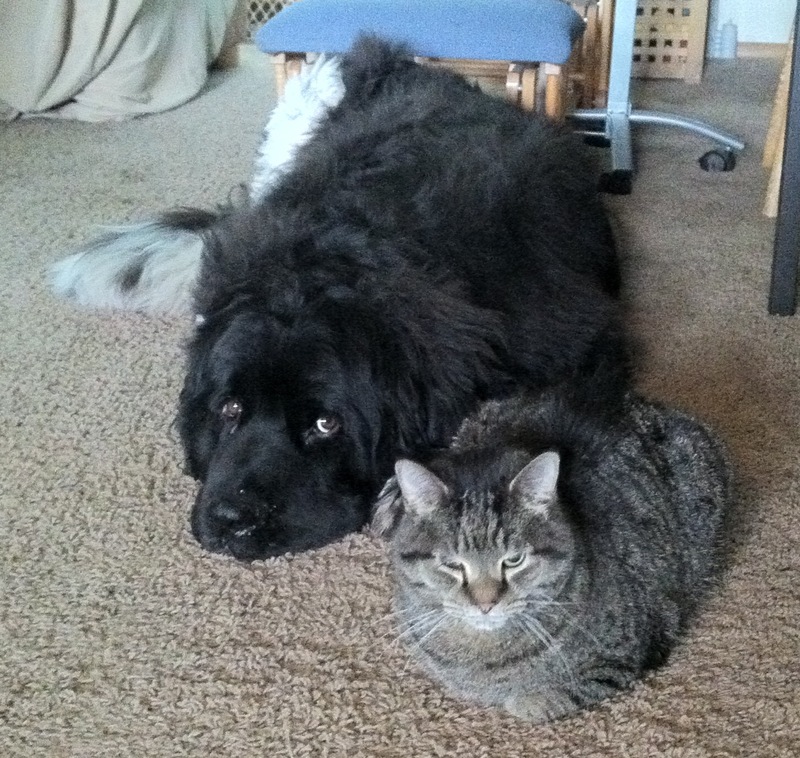 Newfs tend to have some of the worst qualities of dogs: big, clumsy, fur everywhere…and, OMG, the slobber. It almost never stops. But here’s the thing: I still don’t think of myself as a dog person. I actually find a lot of dogs annoying. They’re cute when you pet them (if they’ll let you), but definitely not something I’d want to take home. I do consider myself a Newf person, though. 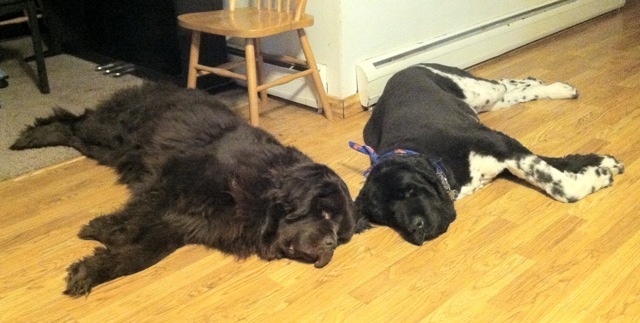 When my older boy was a baby, his grandparents had a Newf that would let my son crawl all over him. The worst he’d do is give a big sigh and look at me with those big, brown eyes, as if to say, “As long as he’s happy, I’ll deal.” Of course, this was several years after our first, and rather terrifying (from my perspective), meeting where he jumped up, put his paws on my shoulder, and introduced himself by giving me a big, slobbery kiss. That dog was the first dog I really became bonded to, and after that, I decided that if I were to ever have a dog of my own, it would have to be a Newf. I find this all terribly amusing because today, as a non-dog person, I will be attending and showing my dog in a conformation event. I never intended to show dogs, but after all the comments on how Gigadog was such a pretty dog (not only from random strangers on the street but people who work quite regularly with dogs), I took her to her breeder to have her evaluated as a show dog. My breeder thinks she’ll have a good shot at getting a title. I just hope we don’t have a repeat of our CGC experience…and that the judges don’t dock for slobber. On the up side, I have another place I can wear some of my formal business attire given I can’t really wear it to work. Shortly after we got Gigadog, I started to wonder if I should get another pup so that she’d have some non-human companionship. I started searching the rescue sites and found a wonderful little pup. After inquiring about the pup, I found out that it belonged to a family with a special needs child who said they didn’t have time to care for it because they were leaving town quite often. I seriously considered it, but after talking with Mike, we decided that puppy day care might work better than getting another dog. The person implored me to come and meet the dog, but I let her know it wouldn’t work. A couple days ago, I found the pup on petfinder. The dog had been placed with a new rescue along with a warning that it shouldn’t go into a house with kids. I’d honestly been feeling bad that I couldn’t bring the pup home with us, but now I’m more relieved. I know it may be a matter of training, but it would have broken my heart if I’d brought home a dog I’d have to give up. And I would have been livid if I’d ended up with a dog that would have gone after my kids! So, to be honest, I was a little angry with the person who originally talked to me about the dog because they failed to mention any aggression issues with children. A lot of people were asking my why I spent so much money on a purebred dog rather than going with a rescue dog. I did seriously consider it. However, I’ve rescued and even fostered cats before, and I know that getting an animal from that situation can be difficult. I’ve had to return and even put down animals before because of behavioral problems that I couldn’t deal with. It’s really a heart-wrenching experience. I knew that I wasn’t knowledgeable enough to deal with a dog that would probably have some behavior issues…especially one that would be over 100 lbs. And there’s no question…if it’s a choice between my kids and my pets, my kids have to come first. On the other hand, you’re in a similar situation if you don’t research breeders well. When I was looking for Gigadog, I almost went with another breeder. Fortunately, I’d read lots of advice and found out about the OFA online database. 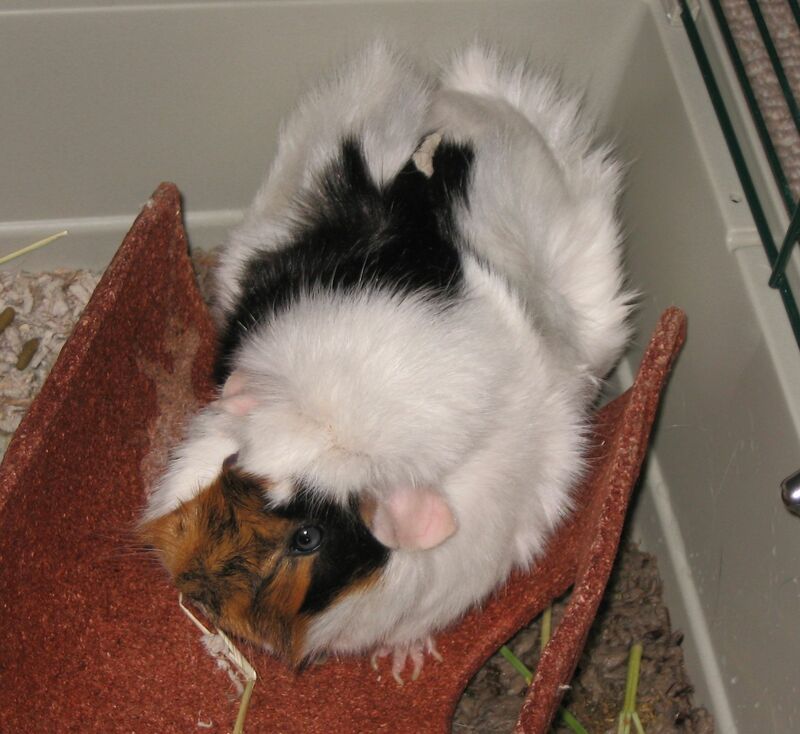 This particular breeder was not currently testing her animals, and the last ones she had tested all showed poor hips and elbows. For a Newfoundland dog, that means she’s probably breeding animals that are not going to be healthy and spend a great deal of their life in pain. The potential owners are also likely to be shelling out a lot of money that they could avoid if they were dealing with a reputable breeder. You may spend less on the dog initially, but can you really afford an additional $10k because your dog has dysplasia? Even worse is the case that happened recently with a breeder who wasn’t taking good care of her dogs and they mauled and killed a lab. From what I understand, this is a person who kept her dogs in deplorable conditions and was breeding for profit. She was using unhealthy animals, and she didn’t train them properly nor keep them from running all over the place. The gist of this is that taking a dog into your home is a big responsibility. HUGE! You really need to know that you’re getting into a big commitment of time and money, and if you aren’t aware of what you can handle, you’ll pay the consequences as well as the dog. Unfortunately, it can be much worse for the dog…which is, in part, why so many dogs end up in shelters, rescue, or euthanized. I’m not saying that you shouldn’t get a shelter dog…but if you plan to go that route, please be ready to sink a lot of time and effort into training one. Of course, you should do that same if you get a dog from a breeder. If you’re going to do that, I suggest reading this post as far as what to look for in a good breeder. The primary consideration in getting a dog is knowing what is involved and whether or not you can handle it. Being cheap may cost you more in the long run, but being ignorant is even worse. We welcomed a boarder to the house for the summer. Say hello to PicoPig. The younger boy’s teacher works at a camp during the summer and can’t bring the class guinea pig with, so we get to have her for the summer.